A Miami developer is under construction on a 21-story apartment tower and plans to move quickly to begin another major development in downtown Tampa. Related Group closed on the land for Manor at Harbor Island, at 402 Knights Run Ave., paying $12 million for the 1.27-acre site in a deal that closed in late February, according to Hillsborough County property records. It’s also secured a $60 million loan from Bank of America, according to property records. “Construction is under way,” Arturo Pena, vice president with Related Group, said Wednesday. In the coming months, Related expects to begin another big development: The demolition of The Tampa Tribune’s downtown offices to make way for another multifamily project. Related closed on the Tribune’s waterfront real estate in late July, paying $17.75 million for the site. The Tribune signed a lease for its offices, which Pena said expires in late April or early May. The Tampa Bay Business Journal first reported on April 17 that Related was targeting the site for a redevelopment play. Despite the proximity of the two developments — they’re about one mile apart — Related doesn’t view them as competing projects. Pena said the group expects the Harbour Island tower to draw affluent empty nesters; the downtown project will likely attract a younger demographic. Pena said Related remains bullish on the rental market and Tampa. Miami-based Related Development LLC, an entity related to The Related Group, is seeking preliminary subdivision plat approval so it can create eight lots and seven tracts for the Maitland Concours North mixed-use development on 96 acres west of Maitland Avenue on the north side of Maitland Boulevard, city of Maitland documents showed. A preliminary plat establishes formal lot lines for the project, as well as tract boundaries for internal roadways and other elements that are part of the planned development. The property — owned by Winter Park-based Battaglia Group Management LLC’s related BPL Maitland Concourse North LLC — is one of the last remaining open large parcels in Maitland that can be developed. 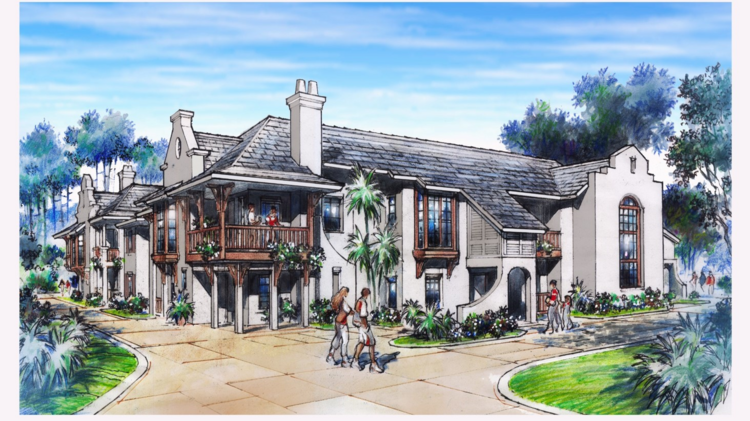 Plans for the site include a 350-unit luxury residential rental community, both apartments and “Big House” townhome units, by Related Development plus a 130,000-square-foot, specialty grocer-anchored shopping center by Lake Mary-based Pelloni Development Corp., as previously reported by Orlando Business Journal. The development is expected to bridge the gap between the Maitland Center office complex on the west side of Interstate 4 and the rest of the city, as OBJ previously reported. It also will bring plenty of needed amenities to the area’s businesses and residents, while also providing upscale rental housing near a major regional jobs center. The city council is expected to review the plat request at its Oct. 10 meeting. The request got recommended approval from the city’s planning and zoning commission in August and the development review committee on Sept. 29. More. A Miami developer has been chosen to build the city’s signature West River redevelopment, a $400 million project intended to expand the revitalization of downtown west of the Hillsborough River. TAMPA — A Miami developer has been chosen to build the city’s signature West River redevelopment, a $400 million project intended to expand the revitalization of downtown west of the Hillsborough River. The Tampa Housing Authority’s governing board today approved the selection of the Related Group as lead developer on the 20-acre project that includes the construction of 1,636 housing units apartments and 177,000 square feet of retail and office space. The project area runs west from the Hillsborough River as far as Rome Avenue and north from Interstate 275 as far as Columbus Drive. The first phase will include the demolition and redevelopment of North Boulevard Homes, the city’s oldest public housing project, and the Mary Bethune High Rise Apartments, a senior center located within the project. In their place will be a mix of condos and apartments, some priced at market rate and some for use as subsidized housing. Related was chosen from among six firms that bid for the project. 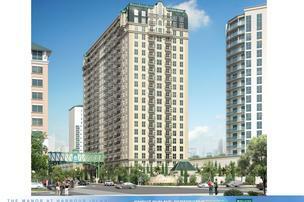 Its recent developments in Tampa have been more upscale projects. It is developing The Manor at Harbour Island, a 21-story, 340-unit tower planned next to Plaza Harbour Island and last year it bought the Tampa Tribune headquarters at 202 S Parker St. for $17.75 million for a mid-rise residential project on the 4-acre site that overlooks the Hillsborough River. Related also built the Pierhouse at Channelside. But the company has experience developing affordable housing projects including Collins Park in Miami, a 124-unit apartment tower for seniors. City leaders envision West River as a walkable, mixed income community that will be further enhanced by the $35 million remaking of Julian B. Lane Riverfront Park, the most expensive park project in the city’s history. Under the agreement with Related, at least 820 rental units and 30 percent of the for-sale homes will be affordable to families earning less than 80 percent and 120 percent of area median income, respectively, housing authority officials said. Steve Patterson has experienced what it’s like commuting on Maitland Boulevard. The CEO and president of Miami-based Related Development LLC previously headed up Orlando’s Zom Development Inc., and he lived and worked in Maitland. So, he has some first-hand experience to lend to the project his current employer is working on: a piece of a new $60 million mixed-use development that may bring to fruition something he hoped for when he was a tenant in Maitland Center. Related Development, a division of multifamily developer The Related Group, plans to build a 350-unit lakefront luxury multifamily complex with garden-style apartments and two-story attached homes similar to townhomes. 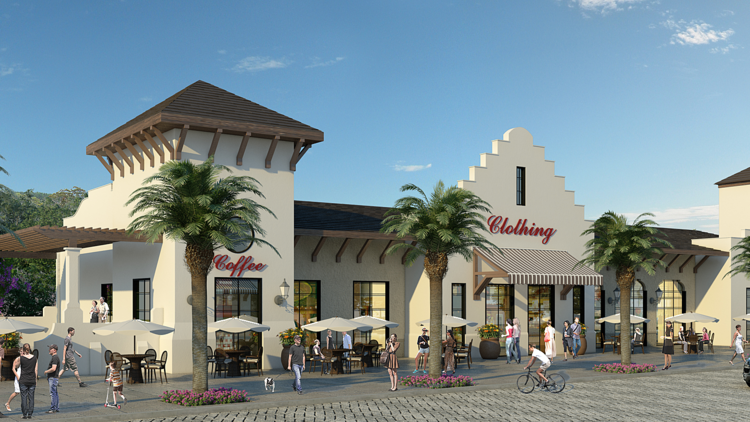 Related Development’s project will be joined by a 130,000-square-foot retail complex by Lake Mary-based Pelloni Development Corp. featuring a specialty grocer, trendy shops, a coffee house, and casual and upscale restaurants. This is the same team that put together the original plans for Mills Park near downtown Orlando, which both companies sold in 2011 to Tampa-based DeBartolo Development Co. and Forge Capital Partners. Together, the two new projects on Maitland Boulevard between Interstate 4 and North Maitland Avenue are set to help create a village-like atmosphere that will benefit not only those seeking a luxury, maintenance-free lifestyle but also for existing residents and workers in the city. Though many neighboring landowners are opposed to the project — those who own homes on Lakes Charity, Hope and Faith have said they don’t want their current view across the lake to what’s now an orange grove to be marred by new development — Patterson said the buildings’ layout and the high-end architecture along with open spaces will continue to offer them pleasing views. And in the process, the project will fill a need in Maitland for updated, upscale multifamily homes. 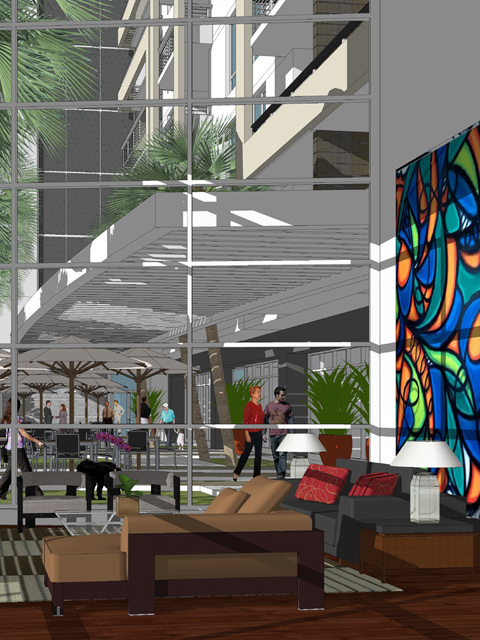 Breezeway: The 254 luxury apartment units will have similar grand entryways into the building and connecting sidewalks that also will lead to the retail portion. In addition, there will be covered parking in the back for residents and enclosed exterior breezeways between the units. Amenities: The complex will offer high-end amenities popular at residential developments today, such as a clubhouse with a fitness center featuring weight room and aerobics/cycling/yoga room, plus some open space known as “great lawns” on the waterfront. Additionally, the walking paths will connect into Pelloni’s planned retail center, now being called The Shoppes. The battle is on for the right to redevelop a 2-acre stretch of city-owned land in Coral Gables, with two teams led by the Related Group and Terranova Corp. in the running. Coral Gables officials sent out a request for proposals mid-year 2015 to redevelop two of the city’s parking garages at 245 and 345 Andalusia Avenue, according to the South Florida Business Journal. Two bids are now up for selection. 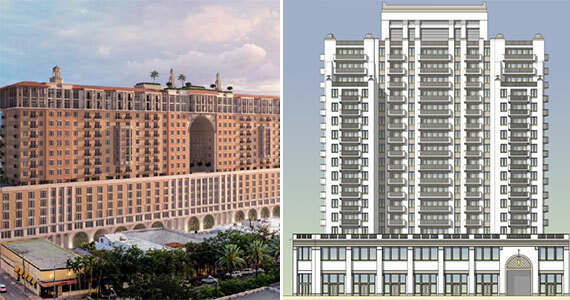 For the first, Related has again teamed up with the Allen Morris Company, proposing a $250 million mixed-use project called the Coral Gables City Center designed by Zyscovich Architects. Theirs is the larger of the two proposals, with a total buildout of 569,094 square feet, according to the Business Journal. Related and Allen Morris want to redevelop the main garage at 345 Andalusia Avenue into a 16-story tower with 140,000 square feet of offices, 11,871 square feet of retail on the ground floor, an outdoor cafe on the 12th floor and 770 parking spaces. Plus, the companies would build out a public park on the site. The second garage would be transformed into a 17-story tower, this time with its primary use being residential. The building would have 270 units — Related and Morris haven’t decided on apartments or condos yet — along with 799 parking spots, 16,878 square feet of ground-floor retail space and a rooftop pool deck, the Business Journal reported. In return for development rights, the city would receive the public park, 20,000 square feet of the project’s office space, plus shared revenue from the parking garages. The partners would also give Coral Gables $5 million if the city allows them to develop both garages at once, instead of in two phases, the Business Journal reported. The second team competing includes Terranova Corp. and ZOM, whose $184.8 million proposal is dubbed the Shops and Residences at Miracle Mile. Arquitectonica and Khoury-Vogt Associates are the architects. 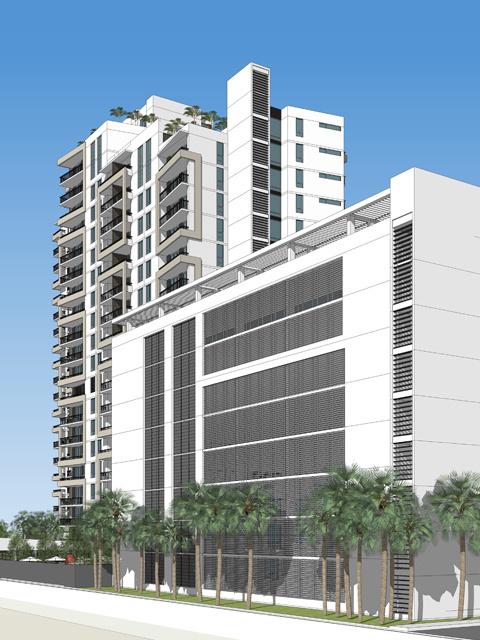 Terranova and Zom have proposed to expand the main garage at 345 Andalusia Avenue to 952 spaces with a 21,260-square-foot office component, while also building a pair of 16-story towers on the second garage and a piece of land Terranova already owns at 220 Miracle Mile, according to the South Florida Business Journal. The tower on Terranova’s land would have 187 apartments and 17,695 square feet of retail space, while the second tower would house 148 apartments and 33,790 square feet of retail, plus 923 parking spaces. Tentative rents would range between $1,900 and $4,500 per month, with units sized from 500 square feet to 1,250 square feet. ZOM would own and operate the apartments, while Terranova would do the same for the retail. The developers would also request financial aid from the city to help fund construction costs, according to the Business Journal. In exchange, Coral Gables would receive 18.3 percent of the development’s revenue, plus annual rent of $205,000 for 99 years. In the late 1950s, before the Palmetto Expressway was built, investors Doris and Alfred Kaskel purchased 2,400 acres of swampland between Northwest 36th and 74th streets, with the boundaries of Northwest 79th and 117th avenues on the east and west. They intended to build a hotel and golf course, according to the city’s website. They christened it Doral, a combination of both their names, and opened it in 1962 at Northwest 87th Avenue and 36th Street. As suburban development in Miami pushed west, home builders, office park planners, and major employers arrived in Doral, which finally was incorporated as a city in 2003. Traffic, Mr. Rojas said, “is a very important topic these days,” and not only because several thousand new residential units and at least three large mixed-use complexes are scheduled to go online within the next few years. “We have created about 21,000 new jobs in the past three years and are one of fastest-growing communities in the state, if not the country,” Mr. Rojas said. Close to 200,000 people come into Doral daily to work, do business or go to school, he said. Major employers include Amadeus North America, Blue Cross And Blue Shield Of Florida, Brinks Inc., Carnival Cruise Lines, Hellmann Worldwide Logistics, Perry Ellis International, Univision Network Limited Partnership and Wal-Mart Stores East, according to the city’s website. A free trolley service spans the city and is popular, he said, and Doral is working with the Town of Medley – site of the nearest Metrorail station – to create circulators that would enable both residents and commuters to use Metrorail to get to work. The city is also expanding its bike paths and investigating bike storage facilities that would include showers so that cyclists could still pedal to work or public transportation during hot weather. Like everywhere in South Florida, the lack of affordable housing is a problem in Doral; much of the housing stock being built is in the middle to upper price ranges, observers say. A ground floor art gallery will display the works of up-and-coming artists as well as provide space for events and social gatherings. Related is seeking local affordable housing funding, while also trying to sell 80/20 tax free bonds to finance construction. Groundbreaking is expected in the third quarter. Demand for affordable housing in the area is high. 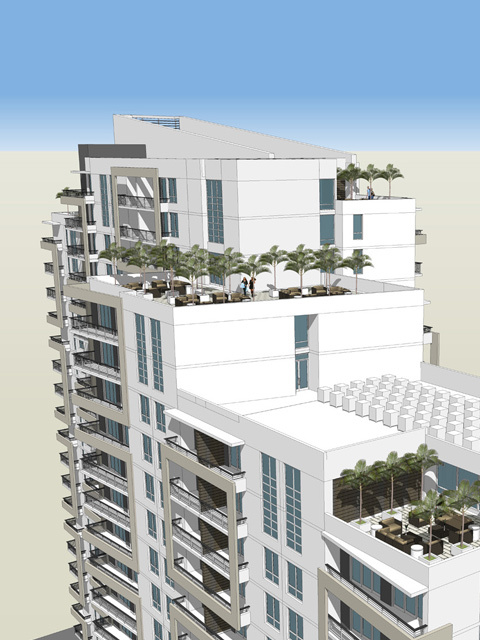 Brickell View Terrace, which was recently completed nearby, received 8,000 applications for 100 affordable units, according to the DBR. 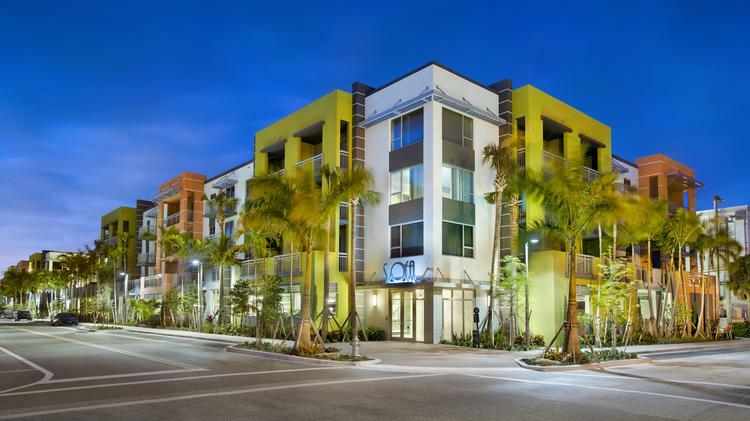 The Related Group sold its recently-completed SofA Delray apartment complex in the high-demand downtown Delray Beach market for $62.4 million. The price of $362,791 per unit shows that investors are willing to pay a premium for apartments in the city’s downtown, where a vibrant restaurant and shopping scene has emerged. RD Delray, an affiliate of Miami-based Related Group, sold the 172 apartments at 150 S.E. 2nd Ave. and 151 S.E. 3rd Ave. to MFREV II-SOFA, an affiliate of Chicago-based Mesirow Financial. Prudential Multifamily Mortgage provided a seven-year, $40.56 million loan to the buyer. The project was built on the 2.58-acre site just south of Atlantic Avenue in 2015 and 2016. Units range from 691 square feet with one bedroom, to 1,296 square feet with two bedrooms. Amenities include a pool, lounge deck, two summer kitchens, a private wine cellar and a tech club lounge with java bar. This was the Related Group’s first project in Delray Beach. The opportunity was identified and pursued for city approval by former Related Group VP Uri Man. The Related Group is best known for building high-rise condos in Miami’s urban core, but its new $12.5 million acquisition is in rural Royal Palm Beach. The sellers were entities managed by Robert Shelley and Brian Tuttle in Hillsboro Beach, named TLH 20 Hughes, TLH 23 Hill, TLH 30 Quareshi, and TLH 27 Lemaster. They sold about 30 acres on the south side of Southern Boulevard, just west of U.S. 441. 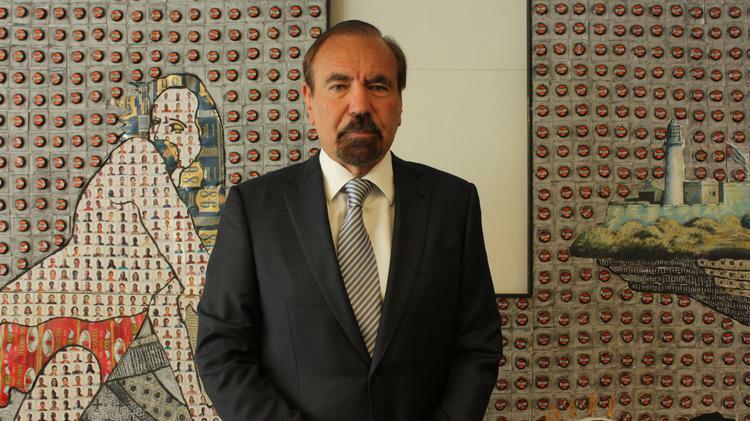 Jorge M. Pérez, CEO of the Related Group. The buyer was RD Royal Palm Beach, an affiliate of Miami-based the Related Group led by CEO Jorge Perez. The addresses of the parcels sold included parts of 10707, 10741, 10823, 10845, 10855, 10881 and 10911 Acme Road. Jay Bailyn, of Boca Raton-based PMA Sales Group, brokered the deal and is representing the seller in other pending transactions in the area. This site is part of a 89.7-acre area that was recently annexed into Royal Palm Beach. The first phase of this site plan included 390 apartments and 150 single-family homes. The second phase would have more residential, plus retail and restaurants along Southern Boulevard, an assisted living facility, a memory care facility and a golf-driving range. Bailyn said the overall site would include a town center and a hotel. A similarly-sized apartment site is under contract to another well-known developer and a public home builder is in negotiations for the southern half of the property, he added. A bridge over the canal along Southern Boulevard should be constructed by year end. It appears Related Group acquired the site designated for the first phase of apartments. Steve Patterson, president and CEO of the Related Group’s rental and mixed-use division, told the Business Journal in October 2015 that it had part of the annexation area in Royal Palm Beach under contract and would build about 390 apartments there. Although Royal Palm Beach bears little resemblance to downtown Miami, the area has relatively high income levels and is a reasonable distance from Palm Beach County’s growing employment centers. CityPlace Doral is Doral’s exciting new 300,000 square foot retail development, a city within a city. The main street, neighborhood shopping, upscale dining, outdoor cafes and entertainment are designed with expansive pedestrian sidewalks to provide the visitors and residents of CityPlace Doral with the excitement of the urban shopping experience. Incorporated in 2003 and named after Doral’s prestigious Country Club (recently acquired and under renovation by Donald Trump), the City of Doral has received numerous accolades for its quality of life by US News & World Report, CNN Money, Business Week, Forbes and the Doral was also listed in Fortune Small Business’ top 100 cities for business and lifestyle appeal. The City of Doral is strategically located just West of downtown Miami and Miami International Airport and has a daytime workforce of over 150,000. Major employers have made Doral their home including The Miami Herald, Carnival Cruises, The Federal Reserve, Brightstar, Boston Scientific and Univision Film Studios. With its shops, entertainment and over 1,000 new residences, CityPlace Doral will become the focal point and downtown shopping destination for the residents and visitors of Doral.